Michael Sam waived by Cowboys. 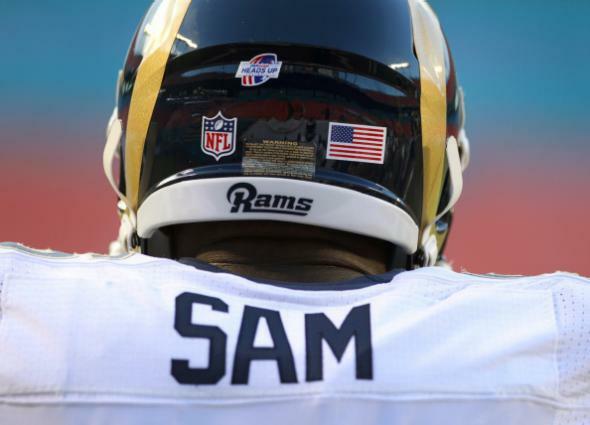 Sam in his St. Louis Rams uniform during the preseason. The Dallas Cowboys have waived Michael Sam, the team announced today. Sam spent seven weeks on the organization’s practice squad. According to SB Nation’s Blogging the Boys Cowboys site, the move was triggered by the team’s glut of players at Sam’s position (defensive line) and is not thought to have anything to do with publicity related to his sexual orientation. Per the terms of the NFL’s waiver rules, Sam can be claimed by any team in the next 24 hours; if multiple teams claim him, his rights will be assigned to the team with the worst current record.